Is is possible to simplify all the suspension choices or make a recommendation? Thread: Is is possible to simplify all the suspension choices or make a recommendation? I use continuous loops on the gathered ends of my hammocks. This allows me to use any suspension system I want from simply clipping them to my Tensa 4 stand to straps with bettle buckles to whoopie slings. Depending on the type of camping, I've used them all. Kayak camping or car camping, I'll take the tree straps with the beetle buckles and Tensa stand. For backpacking, whoopie slings with 2 inch tree straps. Each suspension has its place and you may want to try them all. How long is your poly webbing? I use a hummingbird style suspension were I have 6' straps with sewn 3" loops in one end and a 1" loop with a half twist in the other. A whoopie sling is larks headed to the short loop. The half twist folds the webbing nicely to mate up with the whoopie sling. This is then attached to a CL at the hammock with a carabiner. I like the carabiner at the hammock end as I also use them to clip in my belt and hat at night. But as you said 1,000,000 different ways. Try one, just go for it and if you don't like it try another. Stopped by the Dutchware shop. Amsteel continuous loop to a beetle buckle. Buckle is on a strap with a sewn-on Dutch hook. Quick to hook up, simple and easy to adjust a single mechanism for suspension length. ...there are a LOT of suspension options. I'm pretty good with the splicing and knots. I'd like to keep things as light and simple as possible, and without too much required hardware. Simple and no required hardware = 12 foot length of webbing with loop sewn on one end (two of these, one for each end of the hammock). Two 8-inch amsteel loops larksheaded to the ends of the hammock, either through an end channel or around a whipped end. Take sewn loop end of the strap around the tree, thread the other end through and tighten on the tree. Becket hitch the free end to the loop on the hammock. Done. Some people use shorter or longer webbing. I think mine are 12 feet and it works for me here in the southeastern part of the country. Shug has a good video of this type of setup where he goes into both becket hitch and J-bend. I find the becket hitch works quite well. I'll linik to Shug's video. If you search YouTube for becket hitch and hammocks you'll find dozens of good videos. Venom straps are shown in the photo above, but poly webbing works just as well, as does Mule tape, Kevlar, etc. Also it's entirely possible to use straps with no loops at all. Tie to the tree with a slipped buntline hitch. You can do both hammock and tarp with zero hardware. The only exception to this FOR ME is door closure for tarps that have them... I use some plastic mitten hooks there. But for every other type of adjustable line such as tarp RL and guy lines, you can use Midshipman's hitch for tarp RL to tree (slightly different from tatuline), Prusik for tarp to RL, Blake's hitch for adjustable guy lines and Marlin Spike hitch for guy lines to stake. That is the entire list of what I use. The only fly in the ointment is that Zing-it doesn't hold any of those knots/hitches well, except for MSH. Better to use a polyester jacketed cord with a core, such as Lawson Glowire. I don't know what the finished bury for a Zing-it SRL would be, but it is a LOT less than 10 inches... maybe something like 2.5" for the fixed loop and 3" for the adjustable?? Personally, I vastly prefer whoopie style for adjustable applications... milk it and done, it isn't going anywhere. Also consider Dynaglide as a more robust option for SRL. Last edited by cmoulder; 02-12-2019 at 06:30.
all i have used is tree straps, 2" webbing with loops sewwd in every 6" or so, i am probably going to get some woopie slings to try soon. just start trying some that you think look like what you are looking for. as you said there are millions of options, none right or wrong. Thanks for all your comments. I have a 25' length of poly webbing. I think I'll cut it in half with a loop at each end for now. I like the half twist idea! I'll do that and whoopies for a start, as I understand those best. I don't care for Whoopies but if you want light, that is certainly an option. Simplest Whoopie option is probably: fixed end of Whoopie larksheaded to hammock, adjustable loop hung over a MSH on a short strap with a single loop (known to some as a hugger.) Various hardware can be incorporated such as clips and hooks as desired. Lightweight straps knotted to CLs (or hang the CL over a MSH), as also shown above is just about as light as a Whoopie set-up. 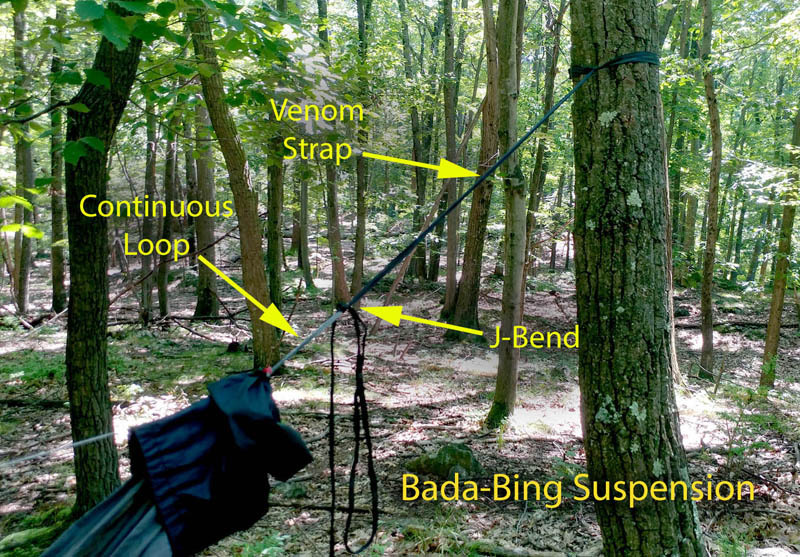 Probably the absolutely simplest suspension is CLs on the hammock, daisy chain tree straps, and 'biners. Not all that light though. Can't see any good reason at all to consider the Hennessey lashing technique. An adjustable SRL is not a bad idea to be able to dial-in a hammock. However, once the correct length is determined, I'm a proponent of replacing it with a fixed one. There are lighter options than 7/64 amsteel but it is the material that a number of the vendors here opt for: tried and true. I prefer a set-up like jtkratzer describes above. The Dutch Clips are a bit handier than a sewn loop and the Beetles are really simple to use. With the CLs, the entire suspension is removable and interchangeable. new to hammocks, trying to narrow down choices. bridge or gathered? pad or UQ? which make?